In 2004 Volkswagen introduced the R32 to the United States. Engineers for Volkswagen were looking to design a top of the line performance vehicle. The R32 was produced from the same platform as the GTI and Volkswagen Golf. However, the R32 was equipped with an upgraded V6 engine and all-wheel drive. 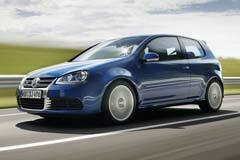 The quality suspension system and sporty exterior of the R32 added to the vehicle's allure. There were only 5000 vehicles produced for sale in the United States making a used model hard to come by. It would be four more years before Volkswagen would introduce an additional R32 model to the United States. The second generation R32 had an increase in power with a 3.2 liter V6 engine. In addition, all wheel drive came standard just like its predecessor. However, the 2008 saw an upgrade in size and interior design. Customers looking to buy a used Volkswagen R32 only have the 2004 and 2008 model years to choose from. However, with a little research, a buyer can find a model for sale.